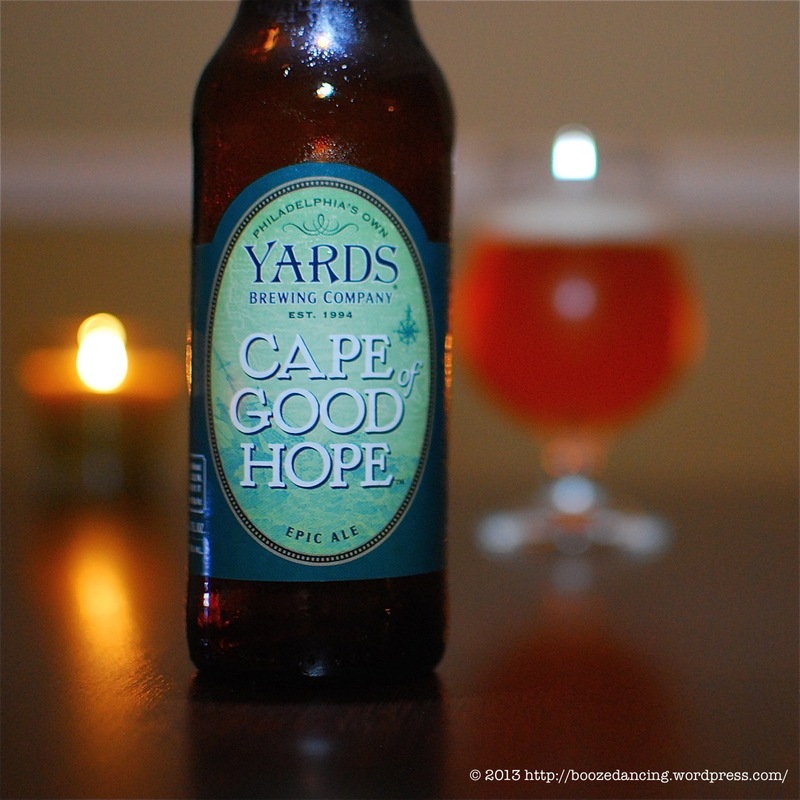 I first had the Yards Brewing Company Cape of Good Hope in cask form during a 2012 dinner with Mrs. G-LO at Amis, a Marc Vetri restaurant in Center City Philadelphia. About two months ago, I almost had it again in cask form at Alla Spina, yet another Philadelphia restaurant owned by Marc Vetri. Unfortunately, the cask was already kicked on the night I dined there, so when I saw a bottle of this beer on the shelf at Wineworks in Marlton, NJ during a recent beer run, I knew that I just had to pick it up to see if it’s as good as I remember. Legend has it that a pioneering brewer made stronger, hoppier ales to survive the epic sea voyages around the Cape of Good Hope from England to India. True or not, Cape of Good Hope is our annual tribute to adventurous brewers like him, and our gift to adventurous souls like you. Appearance: Slightly cloudy, pale orange color. Fast rising off white head that settles to about an 1/8 of an inch. Thick, sticky lacing. Aroma: Uber hoppy with both citrus (think tangerines and grapefruit) and evergreen notes. Also getting some tea biscuity sweetness and a smattering of funk. Taste: Lightly carbonated with a slight fizziness. Starts off with a firm hoppy bite with lots of pine resin and grapefruit zest coming through. A bit of honey sweetness at mid-palate. At the finish, the hops intensify a bit and concentrate on the middle of my tongue. Moderately dry and astringent with a soothing bitter aftertaste. I am happy to report that the Yards Cape of Good Hope lost very little in its translation from cask to bottle form (the cask version was a wee bit smoother and creamier). While I can’t say that I have explored much of Yards line up, I can say that this is easily the best Yards beer that I’ve ever had. This is a solid Double IPA that I recommend without reservation. Cape of Good Hope (aka Cape of Good Hops) is, far and away, the best brew in the Yards lineup and the only one I’ll seek out from time to time. Yards is wholly underwhelming for me a brewery that I want to be great because they’re local, yet is just kind of average. Nothing great, nothing terrible, just kind of there. I tend not to pick their stuff up, but I’ve heard so many good things about this beer I may have to break from that. I think it’s well worth trying, particularly if you can find it on cask. I feel the same way about them, i.e. ok, but nothing truly special. That being said, I did pick up a bottle of their Thomas Jefferson Ale and Pynk. Here’s hoping they prove me wrong. I mean, I really want to love their beer! I liked Thomas Jefferson, but it falls in line with the rest of their lineup – good but not great. I am curious about Pynk though. I’ll be sure to report back with my findings. It’s all in the name of research!